We all know that natural breast enlargement is considerably cheaper (and safer) than implants but do you know how much it really costs to grow bigger breasts naturally? There are many factors that go into how much a natural breast enlargement program will cost but most important is duration. It is highly recommended by manufacturers and NBE’ers that you give a breast enlargement program at least 3-6 months to work, ideally 9-12 months, if possible. With that said, below are 3 and 6 month estimates for each breast enlargement method available. There are two ways to go about it when it comes to herbal breast enlargement – commercial blend or individual herbs. A commercial blend is a pill that is formulated with a mix of breast enhancing herbs and other supplements to help breasts grow. With individual herbs, you purchase each herb in your program separately so you might have a bottle of fenugreek, a bottle of wild yam, etc. Some NBE’ers prefer this method because it gives you more control over what you’re taking and can be cost effective. For the commercial blend cost, we’ll use our favorite herbal blend company Greenbush Naturals an as example. For the individual herbs, Nature’s Way brand offers high quality products at a great price on Amazon. There are a number of individual herbs you can take for breast enlargement. Some people take a few different ones while other takes 4-5 different herbs as part of their breast enlargement routine. For this example we’ll stick with the top three herbs for breast enlargement. Also – the cost can vary greatly depending on what your dosage is and how many bottles you go through in a month. The example below is for one bottle of each herb per month. If you’re doing a herbal pill regimen, you’ll probably want to add some type of boobie batter to massage your breasts with which will add to the cost of your regimen. A boobie batter is a homemade massage oil or cream. It generally consists of a base (ie olive oil, borage oil or cocoa butter) mixed with either herbal extracts or contents from an opened pill. 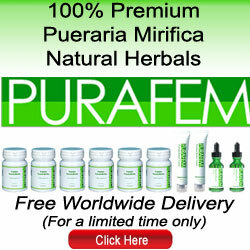 Pueraria Mirifica comes in a wide range of prices. For this cost example, we’ll use Purafem. There are generally two options when it comes to Bovine Ovary supplements. Bountiful Breast at one time was very popular because it was the only option available and was formulated for breast growth. Recently more and more people have moved to Swanson Raw Ovarian Glandular which is not formulated for breast growth but many say it is just as effective. The cost per month can vary depending on dosage and number of bottles you go through in a month. The example below is based on one bottle per month. There are two popular brands for breast enlargement pumps – Noogleberry and BRAVA. They differ greatly in price but we’ll go with Noogleberry for this example which is a popular brand because of its low cost and effectiveness. Please note that these costs are for the very basic of programs. Most people combine at least two of the methods listed above for effective breast enlargement, though not necessary. For example – a regimen might consist of Noogleberry and herbal pill + cream or bovine ovary pills with a Volufiline cream. The estimates also do not include the additional supplements you may want to take like protein powder, hyaluronic acid, collagen, GABA, etc to boost your routine. This also does not include any extra accessories and gadgets like heating pads or accessories for your Noogleberry. We want you to be successful and part of being successful is knowing what you’re getting yourself into. Know that natural breast enlargement is a commitment of time and money, at least a 3-6 month commitment or more which means 3-6 months or more of supplies. We wish you all the best on your journey – Happy Growing! Next articleHow Do Breast Enlargement Pills Work?